Lijiang (丽江; Lìjiāng) is a small city in Yunnan Province, China. The city has a history of at least 800 years and may date as far back as the Song Dynasty. It guards the division of the Jade River into three streams, among which canals and waterways were cut to flow along the old town streets. A book by an American commissioner brought the town some fame in the 19th century and foreign tourists began to return soon after China liberalized its visa policy in the 1980s. Local people began restaurants and cafes and then came to domestic and international attention following a 1996 earthquake. Amid the destruction, China's people were drawn to the lifestyle and excellent environment around Lijiang and began pouring in. Domestic movies and TV shows have made it as popular as Yunnan's reigning vacation destination Dali, although Xishuangbanna is rising as well as the other two become more commercial and expensive. Lijiang Sanyi Airport offers many flights to Kunming throughout the day. Less frequent flights also go to the bigger Chinese cities such as Chengdu, Chongqing, Beijing, Shanghai, Shenzhen, Guangzhou, and Xi'an, sometimes directly and sometimes through a connecting flight. The shuttle to Kunming is only 50 minutes and costs between 400-700RMB with tax. International flights have begun since mid-2011 but at the moment, there are flights only to Kuala Lumpur (Malaysia), Hong Kong and Taiwan; and occasionally Seoul (Korea). The airport is 35 minutes (22km) from the Lijiang Old Town and around 45 minutes (28km) from Shuhe Old Town, in the suburbs of Lijiang. You can take a taxi (80-100RMB) or the shuttle just outside the arrival hall to the Blue Sky Hotel (20RMB). It leaves when it is full and the other end is 1km from Lijiang old town. A taxi from the shuttle bus terminal to the old town will cost around 10-15RMB. Buses to the airport leave about 100-120 minutes before flights, giving you at least an hour to check in. There are several daily services to Dali and Kunming. A ticket booking office is located on the north side of the road several hundred metres west of the bus station. The train station is an impressive structure about 7km south of Lijiang old town. Several public bus lines serve the station, including the number 18, 16 and some number 4 buses (every 30-40 minutes). Fare is 2 yuan. Taxis are reluctant to use the meter and will demand high fares of 30-40 yuan, though with bargaining 15 yuan may be possible. Be aware that taxis are not easy to come by at Lijiang railway station. An alternative is the small SUV-type vans which cruise around offering a share-taxi service. A hard sleeper berth (with a cabin of 6 berths, with no door) from Kunming to Lijiang costs ¥179 and runs from 10PM to 7AM. The soft sleeper car (with a cabin of 4 berths, with a door) would cost you about ¥205 on the same train. If you travel by a small family, parents and a kid, consider the VIP chamber which is at the price of ¥614, one less than purchasing three individual tickets in a four bed standard room. You may feel a bit tight for luggage storage space, but you gain more valuable privacy, with your own family. From Dali the train is a faster, cheaper alternative to the crowded buses: Hard (padded) seat is about 31Y, and the journey takes only 2 hours from Dali city. There are two bus stations, one located south of the old city called the Lijiang Bus Station 丽江客运站, and another between Shuhe Old Town and Lijiang Old Town called the Express Bus Station 高快客运站. Regular services to/from Shangrila and Dali and overnight service from Kunming stop at both stations. There is also a bus to Kunming travelling in daytime, taking about 8 hours. You can take the bus 11 in front of either of the bus stations to the old town or take a taxi. From Dali, minibus/bus at 55/60¥ about every 30/60min, taking 2-3 hours. There is a direct bus from Chengdu which starts at 11:20 at Xinnamen station in Chengdu. It takes about 24 hours to do the trip, and cost about 280¥. Alternatively, you can take a train from Chengdu to Panzhihua (15h, ~191¥ for a hard sleeper) to arrive in the early morning. At the exit of Panzhihua train station, take one of the bus 64 on the left of the exit and get off at the terminus, which is the bus terminal (3¥, ~1h). Then, you can take a bus to Lijiang, which run every 45 minutes from 7AM to 1PM (from 83¥ to 92¥, ~8h). Walking is the only option in the old town, while taxis or shared private cabs (Didi) are often the easiest way around the rest of town, starting 8RMB on the meter. Make sure you have the exact location info or address for the cab driver. Get your hotel to prepare the information for you in Chinese in advance. Fracture alert: Watch where you are walking. It is easy to trip on the cobblestones or fall into the canals from the walkways or bridges, many of which do not have handrails. The cobblestones can be very slippery when wet. To see the sights outside the old town, the options are walking, biking, public bus, private blue or green mini-buses (bread vans), or taxi. The public bus mainly stays within the city and stops at 8-9PM. There is a convenient Bus No. 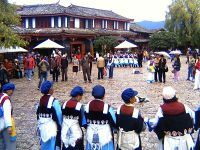 6 that takes you from outside Lijiang Old Town to Shuhe Old Town, and further-on to Baisha Old Town and even Jade Water Village at the foot of Jade Dragon Snow Mountain. The blue mini-buses are the same price (1-2RMB per ride) as the public bus within the city. They will have the number 38 on the front windshield. The price of a shared mini-bus from Lijiang to Shuhe Old Town is between 3-5RMB per person, but the starting location within different towns and villages varies, and usually you have to wait for the minibus to fill before departing. If you do not know where you want to go and are limited on time, the best option is to rent a taxi or mini-bus for the day, but the price can vary wildly from about 200RMB all the way up to 500RMB per day. The price mainly depends on whether you can speak Chinese, how comfortable you look when you try to bargain the deal and also the distance you will be covering. In Baisha village, there is an old woman named Liu who will sometimes stop tourists and invite them into her home. She is a very nice lady, who will show you pictures of people who have visited her home as well as messages that people have left in her guestbook. She will feed you snacks and tea and make you feel welcome. Before letting you leave, she will ask for a small 'donation' (around ¥10 per person). Loads of tourist shops available in old town. Probably overpriced, but Lijiang does not have as many cases of the Westerner price being too much higher than the Chinese price as in many other parts of China. Burned wood carvings - One of the popular local specialties. Quality varies greatly by the individual artist, and prices vary by shops. Some shops do custom etchings of your face (near photo-realism) with Lijiang in the background. Expect to have your picture taken, then come back in a few hours. Yak horn combs - Also popular, with some combs also carved from the yak hoof (the ones with the rougher edge on the handle). Naxi clothing - For ¥5 you can get your picture taken in them without having to buy them. Local skirts that include Ancient Egyptian designs maybe are actually pictographs the preceded Chinese characters. Art and writing samples (东巴; Dōngbā) - The Naxi have the only living hieroglyphic language in the world, and shops with samples of it, or of the unique Naxi style art, are abundant. Yunnan Coffee - Coffee ground to a fine powder then added to water, although most contain milk and sugar powder already. Pure Yunnan Coffee can be bought in 300g bags either as roasted beans or ground at Cornerstone Cafe for 40 RMB. https://www.tripadvisor.com/Restaurant_Review-g303783-d14011802-Reviews-Cornerstone_Cafe-Lijiang_Yunnan.html for the address. Warm Clothing - In the Old Town warm clothing is quite expensive if you are just looking for something cheap to keep the chill out. The road just outside the town by the waterwheel has very cheap hats, mitts, and even long johns. Just turn left at the first intersection. Small red coconut - DO NOT BUY a small red fruit shaped like a coconut. Actually, it is just a coconut painted red and sold for a very high price. This is a scam. Baba - a flat wheatbread available; a savoury version sometimes served with chili sauce and a sweeter version that tastes honey-flavoured. Naxi style fried white cheese - A soft white cheese cut into slices then fried in a non-greasy batter. Served with sugar sprinkled on top and very delicious (only seen in restaurants). Yak's milk yogurt - Has a bit of a different flavor than cow's milk yogurt, but very good. Commonly served with honey, muesli, and/or fruit. Can also be made into fruit shakes. Fried yak meat - served on skewers. Food within the old town tends to be pricier than outside of the old town, though some fancier food establishments have also started to open up in the surrounding neighbourhoods, such as near the newly opened Walmart in the south of town. The Crowne Plaza in the old town has 2 restaurants. One is a coffee shop specialising in South East Asian and Western dishes, and a buffet priced at Rmb 200. The other is Chinese, which serves decent Naxi cuisine, and for a change it looks better that what is dished out in the Old Town. This restaurant has a fabulous view of the Jade Dragon Mountain, so a lunch or an early dinner can be enjoyed with a fab backdrop. The other bonus is that both the restaurants serve a good variety of chilled white wine, which otherwise is unavailable in most places in China. Meal for 2 with reasonable wine could cost around Rmb 600 with a decent wine, and 3 dishes. There are a couple of local drinks worthy of special mention. Lijiang Yinjiu and Sulima (both commonly available in Lijiang) are modern renditions of ancient beer types of the Naxi and Mosuo people and far more enjoyable than the typical bland Chinese lager. Yunnan is famous for tea, as well (though Pu Ehr itself is way down south on the road to Xishuanbanna) and every fourth shop is a tea shop specializing in the length and breadth of Chinese tea, the likes of which you will not find in your average Western Chinatown. Unlike the rest of China, Lijiang's cafés and restaurants shut down around 11PM. Several of the bars along bar street face each other across the narrow canal. From here singing erupts across the water by opposing teams of (usually) girls. In order to keep the singing going small donations are normally requested from the patrons. Lijiang has plenty of hotels and guesthouses to fit all budgets and desires. Some prices below are very out of date and you should check official online sites for updated prices! Some of the "budget" guesthouses now charge four times as much as prices listed below. There is an official Old Town Maintenance Fee of 80 yuan per person to visit some attractions in the old town, such as the Black Dragon Pool park. It is sometimes difficult to find specific addresses in Old Town so do ask the frontdesk to pick you up from an obvious location, such as the local police station, the Water Wheel or MacDonalds or KFC. One of the best option, especially in low season, is to walk around town and check actual prices and rooms to see which suits you best as there are many different options to choose from (in the winter ensure there is a heated mattress pad or heating in the room as the nights are quite chilly). There are a few budget guesthouses that cater to foreigners, Garden inn, Timeless and Mama Naxi (the official Garden inn and Mama Naxi are not located in Wuyi Street, both have moved out of the old town because of the tourist fee). All these guesthouses have a staff that speaks good english and can help you out with information. They also enable you to meet other people. You can get a private room there or dormitories for average price. Across from the Timeless there is a tea store that is home to the world's cutest dog, 球球 （qiu qiu). There are hundreds of cheap Chinese guesthouses not listed below. To find them it's best to ask around, or stand in the train station bus drop-off stop (East of the water-wheels central square) with a big backpack and look lost. Local ladies will approach you: expect to get a basic double room for around 100Y-150Y, depending on the season. Prices usually more than double during the peak season. Banyan Tree, Lijiang, Yuerong Road, Shuhe Old Town. Tel: 0086-0888-5331111. . For those with deep pockets the Banyan Tree Lijiang is possibly one of the world's nicest hotels with rooms at 3,000++ Yuan per night (price of Apr 2008). Placed way out in the middle of farmland, this hotel is quiet, peaceful, and from afar looks like a fortress village. The "rooms" are small villas built in traditional farmhouse architecture, comprising of a bath, study and bedroom with a direct view of the Jade Dragon Snow Mountain, a private garden, patio, and an outdoor jacuzzi. The food here is mediocre but the prices are comparable to the touristy parts of the old town with meals costing 30-40 yuan. However the water is outrageously expensive with a bottle of Perrier setting you back a staggering 45 yuan, making it more expensive than a glass of wine (38 yuan). A taxi is required to get to and from the hotel (10-15 yuan to the old town). (current Nov 2006) NOTE: This hotel is quite far from the center of Lijiang city. Guanfang Hotel. Although not located in the old town (it's in the new city), you can get a taxi ride from this hotel to the old town's entrance for a reasonable fee (less than 10 yuan - US$1.50). Guanfang hotel is actually part of a hotel-chain owned by a Yunnanese hotelier group - it has "Guanfang hotels" in other cities in Yunnan province. The Lijiang Guanfang hotel is built to a resort (bungalow) style. The hotel ground area is very big and you have to walk quite a distance from the hotel lobby to your assigned bungalow (containing a number of rooms). But the rooms are pretty spacious and it's beautifully set and are between 4-5 stars. Intercontinental Lijiang Old Town. Located at the edge of the old town, minutes walk away from a bustling food street, the Intercontinental Lijiang is built in an architectural style similar to the old town itself. The hotel grounds are beautiful and the rooms are spacious and comfortable. A breakfast buffet (7:00-10:00am), catering to both Western and Chinese palettes, is included and is a definite highlight. The hotel also boasts a high-end Sichuan restaurant with well-prepared, albeit expensive fare. Even though hotels and tourist attractions are generally peaceful and safe, Lijiang is not absolutely crime-free, with incidents of drunken fights amongst tourists and petty crime still being reported. However, the government has taken steps to install surveillance cameras in the streets, and cops patrol more actively in recent years. Nonetheless, beware of crimes involving "alcohol touts", women who are hired by bars and restaurants to lure unwary male tourists into these establishments before handing them a hefty bill for purchases made by their "companion" (who may in the meantime have secretly left). Some shops in the old town have signs refusing business to Japanese citizens. Even though most of these are ploys to attract business from nationalistic Chinese travelers, if you are a Japanese citizen it would be wise to refrain from speaking Japanese in public. There are 13 ethnic groups living in Lijiang. When visiting local families, be respectful of their etiquettes and taboos. Ask before taking photographs of old people and children, and do not walk into local houses even if the doors are not closed as there may be guard dogs inside. In the Lijiang Old Town, it is not allowed to ride the bike or any motorised vehicles. Lijiang has a clear annual distinction between the rainy and dry seasons. The rainy season lasts from mid June to October, especially in the months of July, August and September. Make sure you bring along an umbrella, non-slip shoes and sufficient warm clothing as it can be cold even during these summer months. Travelling in summer, T-shirts and trousers are usually enough in the daytime, but it is advisable to take some warm clothes for the early mornings and evenings, and for the other seasons. What’s more, don't forget to protect yourself from the strong radiation from the sun. Shuhe Old Town, 5km north from Lijiang Old Town. 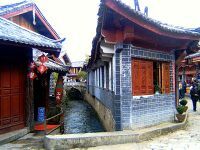 Sometimes considered Lijiang's best-kept secret, about 200 years older than the latter and with some well-preserved houses, quiet alleys and one of the oldest stone bridges in all of Lijiang. There are two sections to Shuhe Old Town, the southern (newly-constructed and artificial) section with the "Main Entrance" requires an entrance fee of ¥40 (which you can avoid by asking taxis to drop you off at the "North Gate") mainly visited by Chinese in tour groups, and the northern (the real thing!) with Shuhe Old Town Square (named Sifang Street), Nine Dragon Pool, Treasure Mountain, temples and quaint alleys and canals. Take public bus No. 6 (from Lijiang old town, drops at Shuhe North gate 束河上村) or bus No. 11 (from Lijiang bus station and Lijiang Old Town, stops at roundabout 2km outside of Shuhe Main gate) and minibus service from Lijiang. There is also a 3RMB shared minibus service to Shuhe which departs from outside Likelong Supermarket at Fuhui Road, which leaves when it's full. Baisha means White Sands in Chinese, first place that the Naxi settled into when they arrived in Lijiang. It is now a quiet village which is slowly opening up to tourism. Its main attraction is the Baisha Frescoes, ancient wall murals depicting Tibetan, Naxi, Bai and Han influences. There is also a Doctor Ho, a famous herbologist who was sent to Baisha during the Cultural Revolution to be re-educated by the farmers and who is known to have healed a lukemia patient using mountain herbs from Jade Dragon Snow Mountain. Dr. Ho speaks good enough English and will happily provide some herbal medicine for whatever problem you have (but be sure to check the price first). Rent a mountain bike or electric scooter from Shuhe and ride for 15-20min to Baisha, get there towards the second half of the afternoon to avoid the crowds. Baisha's also a great spot to go for a day's hike, surrounded by nature, you can hit the tracks fairly quickly. Qiaotou for Tiger Leaping Gorge - regular bus services are available from the main bus station. 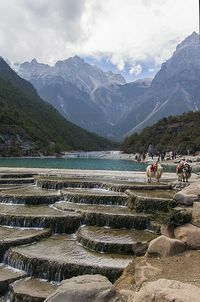 You can also take any Shangri-La bound bus and have the driver drop you off at Qiaotou or Hutiaoxia Town, which is halfway between Lijiang and Shangri-La. Cost is ¥50. If you take a Shangrila bus, make sure to ask for the ticket to Qiaotou only, otherwise they will charge you the full fare to Shangrila. Shangri-La, it is ¥60 from Lijiang to Shangrila by express bus. about 4h trip, bus every hour. Dali, direct bus to Xiaguan, Dali new town. You need to take another bus to Dali ancient city. There is also direct bus from Lijiang to Dali ancient city, ask the hotel or tour agent to book the ticket. All of the Lijiang buses pass the Dali old town on the way to Xiaguan. Just tell the driver to drop you off in Dali. Shaxi ancient town, between Dali and Shangri-la. There is no transport direct to Shaxi, you need to arrive at Jianchuan first. An express bus operates from Dali(Xiaguan) to Jianchuan, and also one from Lijiang to Jianchuan, you need to check the schedules. A minibus will also take you from Lijiang to a border of Jianchuan and Lijiang, where you need to take a minibus to Jianchuan city, and continue with another minivan to Shaxi old town. Or you can just flag down any bus going From Dali to Shangri-la and tell them you're getting out in Jianchuan. Shaxi is considered the most well-preserved market town along the Ancient Tea Horse Road. Nice Friday market and square. Very picturesque. Nearby is the attraction Shibaoshan, famous for its Buddhist grottoes and mischievous monkeys. Lugu (or called Lugu Lake), northeast of Lijiang in Ninglang county near Sichuan border. Known to be the home of the matriachial Mosuo ethnic group, a sub-branch of the Naxi. Direct bus from Lijiang, the road is very rough for the first 30 min. Takes about 5-6 hours, but a new road is being constructed which will reduce the journey to 2-3 hours. Since 2016 Lugu is also served by an airport. Increasingly popular with Chinese tourists. Kunming, the province capital. There are train and bus services direct to Kunming from Lijiang. Jinghong, Xishuangbanna. Daily non-sleeper couch bus departs at 7:30 and arrives about midnight. ¥242 (October 2016). This page was last edited on 16 April 2019, at 08:21.